You wouldn’t know it from looking at my living room floor, but Hot Wheels sales in the U.S. haven’t budged in three years. The problem? According to one Mattel executive, moms just don’t know how to play toy cars with their sons. SCREECH. That was the sound of toy car-playing moms everywhere stopping short. My 2-year-old son and I spend hours counting his cars, driving them across the coffee table, and sending them through a “car wash” under the couch. What’s hard to understand about that? Magda Pecsenye, a parenting writer at AskMoxie.org and an MBA student, says she finds the whole concept insulting as a mom. What is this strange thing you call "playing cars?" 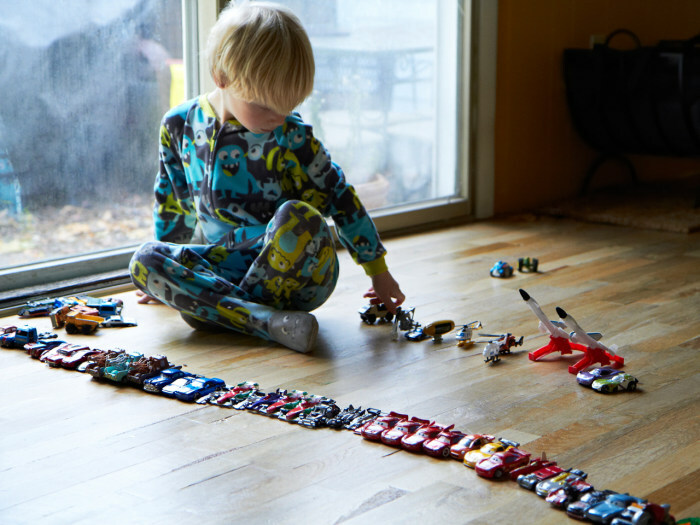 Some toy company executives think moms are baffled by their sons' love of toy cars. Petersen’s comments came after Mattel hosted a brunch in Manhattan for bloggers to help women understand why their kids — especially their sons — play with toy cars and how to join in the fun. It’s part of a broader effort to accelerate sales by targeting moms, the primary purchasers of Hot Wheels. Cooper stressed that not every mom struggles with playing with toy cars, but said Mattel research shows that some do. “It’s something we thought was important to address,” she said. At the blogger brunch, Mattel representatives suggested taking a Hot Wheels into the tub to help with bath time. Company reps also pointed out that moms can teach math and organizational skills by lining up the toys in color, size or types. While some moms are offended by the notion of remedial Hot Wheels lessons, two who attended the brunch meeting said they appreciated the tips. Raijean Stroud, who runs the blog Swa-Rai.com in Oak Park, Ill., said she learned something from the hour-and-a-half long meeting. Still, Pam Davis-Kean, a professor of developmental psychology at the University of Michigan, said Mattel’s thinking about moms and toy cars seems outdated. Corey Binns writes about parenting, health and science. You can follow her @coreybinns.